If you've landed here you probably know that the crib plans out of the latest woodworking magazine may be too advanced for beginners to woodworking. DIY ers just starting that are ready to tie on their carpenter apron and get to work often get so frustrated with the complicated instructions and blueprints that they just quit after shelling out their cash for wood and tools. They are simply not ready to build a baby crib with lots of moving parts and springs. This does not mean that they can not get the job done; they just need an easy set of plans that includes easy-to-read instructions. It's always a good idea to choose sturdy wood that is easy to work with for your project. Pine is a good wood for many furniture projects and it has many very attractive qualities PLUS it's very inexpensive. 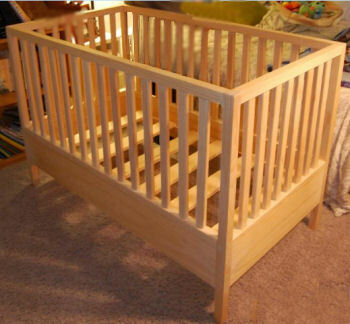 Some woodworkers feel that because pine is a soft wood that it is unsuitable for a baby bed. Others feel that the "knotty" appearance of pine is less than pleasing. Pine's wood grain is less elegant than exotic hardwoods and oak but it is perfect for a rustic nursery in a log cabin or hunting camp. Exotic hardwoods can be a bit pricey (especially for your first furniture building project) so many woodworkers choose oak. Oak is durable, easy to work with, attractive and affordable and can be stained and finished with excellent results eliminating the need for elaborate carving or details in the wood. The simplicity of the crib's design in and of itself can be lovely and most desirable with a look that is timeless and that will last for decades of use. Fewer details translates into less need for carving tools and less effort to keep the slats and rails clean and looking good which is important to every mom with little time to spend on polishing and dusting furniture. 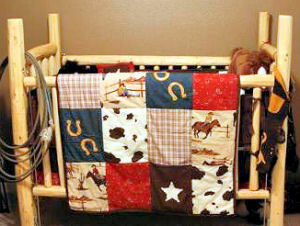 Please visit Unique Baby Gear Ideas again soon to see more easy woodworking plans that can be used to build an heirloom that will last for generations and to save money on nursery furniture.